last night was the first night of houston restaurant week - a week long foodie fest of 3 course dinners for $35 at most of houston's top restaurants. $5 of each meal is donated by the restaurant to the end hunger network. the houston chowhounds waited patiently for weeks for HRW menus to be posted, then studied, debated, deliberated, and prioritized which restaurants they would patronize, diligently made their reservations and waited for HRW monday to come. this is where the houston chowhounds went and what some of them had to say about *17, monarch, VOICE, the oceanaire, the grove, and arcodoro. a group of houston chowhounds, industry folks, and i went to *17. we had a table of 10 and the service was friendly, professional, but a little slow. the restaurant only got about half full throughout the night. an amuse of tuna tartare on a watermelon radish chip set the dinner into motion. i was busy taking photos of it with my camera, and then the amuse disappeared before she eats and i could eat it. for starters, almost everyone at the table chose the seasonal roasted tomato soup. our server told us there was crispy pork belly in it, so the baby lettuce salad dressed with EVOO & sherry vinegar largely skipped by everyone at the table. but when the 1st course was dropped, not a speck of pork was to be found at the table. the soup was boring and a tad acidic for my taste. second course was a choice between halibut w/ corn pudding or a NY strip w/potatoes puree & sauteed spinach with a bordelaise. the "NY strip" was a 4 oz. filet -no grisley strip of fat was detectable. both portions were slightly larger than tasting menu size. the "corn pudding" was a creamed corn. neither dishes were bad per se, but more reminiscent of lukewarm wedding banquet food. third course was chocolate fondant cake or ice cream. i had a bite of the cake and it didn't excite me, but chocolate rarely does. it was dry and a little bittersweet. it probably would have been better with a bite of the ice cream quenelle which arrived half melted on the same plate. i opted for the coffee ice cream and received 3 small scoops. i was initially quite sticker shocked by the wine prices, but i realized that i have been spoiled by the wine lists at catalan, ibiza, VOICE, and reef. they sent us home with a voucher for a free cocktail at a+, the bar at the alden, or free dessert with the purchase of a meal at *17. i can't say i was blown away. jokes were also flying about stopping at catalan or somewhere else for a bite to eat on the way home. and misha did just that. if you still want to hear more, here is ruthie's account of the evening. "I went to Voice last night with my family, and we had a really good time... they did present us with the full menu also so we could peruse, which was good because we were waiting on a couple more people and ordered the truffle fries and the ricotta ravioli, both of which were great, though I will say the ravioli was very well made, bright, and summery. We ordered the entirety of the HRW menu (since there were seven of us) The corn risotto was good, though I think it could have been a little creamier. I'll echo everyone else's love for the mushroom soup cappucino, with the intense mushroomy flavor. I didn't get a chance to taste the apple and blue cheese salad, though I will say it looked like a lot of greens for an apple and blue cheese salad, but my brother who had it really liked it, so I'll go with his opinion. For mains they had a very well braised and tender shortrib, pan seared snapper with hearts of palm and peas, which was light, not overcooked, and with a crisp skin. The only problem I had was with my main, the pork sous vide. In my experience with sous vide, most everything that comes out of that bag is immensely succulent and juicy, but what I received wasn't poorly cooked or anything, but especially dry for something that was supposed to be sous vide... I knew this was a HRW menu item, so I ate the accoutrements, and didn't want to cause any trouble. But my family made me tell the waiter since I always tell them that if a customer ever has a problem with anything I really want to know and want to make it up to them. I told the waiter I didn't want to trade out my dish, but I just felt like Chef Kramer should know, but he insisted that I get something else, so they gave me the duck which was by God, a delicious, sweet, smokey concoction and more than made up for any dryness of my pork. Dessert seemed to be a bit of an afterthought. The most interesting thing on the menu was a chocolate cream pie with five spice ice cream and an orange tuile (which didn't show up on any of our plates, now that I think about it) The crust seemed underbaked, but the five spice ice cream was delicious. While now that I re-read this post, it sounds negative, I just want to say that the food at Voice was very good, and yes, I would go back to try its full menu. Especially after tasting the duck, I'd like to go back and get the full tasting. I want to say that the server, Alan was absolutely professional and personable, and if you have a chance to request him, please do. I'd also like to give a shout out to their wine list, which was not only interesting and had a wide variety of funky selections, but was also very, very well priced with a lot of good wines in between the 40-60 dollar range. We had a white from Rioja, a Burgundy from Chateau Parent, and a Meritage blend, "optu" from fidelitus in Columbia Valley, WA. For the prices there that don't seem too "hotel-y" for both food and wine, I hope Voice does well. Houston would be a better place with more restaurants like it." The manager ended up talking to us for awhile about wines and doing the first pour for us when 3/4ths of us settled on buying a bottle instead of the wine pairing (we went with a bottle of what was being paired with the short ribs, the name escapes me at the moment). We were provided with bread (first round tasted like hockey pucks! I don't know how long those had been sitting around) with a garlic paste, butter, and sun-dried tomato/olive spread. It took a while for the bread to come out and the water didn't arrive at the table for quite some time. I had the Summer Risotto which was pretty disappointing. It tasted like regular long grain rice was used and it was not creamy at all. The teeny tomatoes in the dish were fantastic, but the corn was pretty unremarkable. I tried a bite of the bleu cheese salad and wished I had gotten that instead. The greens were very fresh and crisp. My husband reported that the bleu cheese was steller. One person at our table got the mushroom soup and ended up having to fight off his wife and my husband (I'm not very big on mushrooms) to be able to finish his own dish. He said the truffle cream really put it over the top. For entrees, it was three plates of the braised short ribs and one plate of the pork loin sous vide. The entrees were delicious. The potatos were beyond creamy and the beef had a beautiful crust and tender insides. One person said he didn't care of the apples on top,but I thought they complimented the celery and tangy flavors of the au jus. The pork loin was on the sweeter side and received highmarks, especially the pancetta and beans served along with. Head chef came by and talked with us for a few minutes, which was nice. He was personable and open to all of our questions. Overall it was a pleasurable dining experience. We were treated very well and left alone but not forgotton. The manager was by to make sure everything was Ok throughout our meal and once our waiter got all of our wine questions figured out he seemed to get a handle on our table. The entrees were top notch, but the desserts and rissotto could use a little bit of work. Next time I'd go with a salad for the first course and skip dessert entirely for the homemade ice cream I have in my freezer." The bread, like Rachel said, were hard little balls, but I did like the garlic paste that came with it. We started off with the summer risotto and the mushroom soup. I really enjoyed the summer risotto. It was creamy and the little tomatoes provided the right amount of tartness to offset the creaminess/richness of the risotto. The mushroom soup was amazing! Light and creamy at the same time. For our entrees, my boyfriend and I ordered the short ribs and sous vide pork loin. Both entrees were delicious. The short ribs were so tender. The apples and celery on top cut through the richness of the meat and potatoes. The potatoes were good, although too buttery for me. Like Rachel said, the pork loin was on the sweeter side. The pork itself, to me, tasted a bit flavorless. It definitely needed the tangy sauce on top. We also ordered a side of truffle parmesan fries. I faintly detected the truffle flavor, but I got almost no parmesan taste. Both my boyfriend and I felt the fries were underseasoned and needed some salt. I was pretty full and feeling a bit sick from all the richness by the time dessert came around. We ordered the chocolate cake served with crispy vanilla ice cream and creme brulee. My boyfriend really liked the chocolate cake, but was disappointed that "crispy" vanilla ice cream meant a vanilla ice cream quenelle rolled in crushed thin cookies. The creme brulee was good, but nothing to write home about. All in all, the food was great, but the service was average. I think once they get the kinks smoothed out, we'll be back for another meal." "We waited over 35 minutes to get our first round of drinks only to be told they couldn't make dirty martinis because they had no olive juice followed by our $20 extra wine pairings were arriving well after the food had arrived. The place didn't look extremely busy, but it seemed that the staff was struggling to stay afloat. Once the manager stepped in to help, the service did take a big step forward. Yes, it was our waiter's third day, and yes, he was overwhelmed. That much was apparent- but the manager was sympathetic and understanding. The place is beautiful, the food was good. I am not sure I will rush back seeing the service problems we encountered, but I am glad I got to check it off my list." 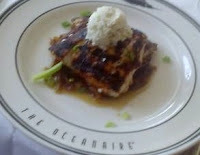 For my main, I went with the black and blue grouper (blackened, with blue cheese compound butter and carmelized onion jam)... It was, in a word, delish. I had to use break to sop up the liquid... the blackened coating had a slight salty note but with the butter and onions it was pitch perfect. After confirming that "black" meant blackened, I ordered a zin to go with the dish. Absolutely great choice - the blue cheese, spicy blackening, and sweet flavorful onions were matched well with the fruity spicy, but not too tannic (appropriate for a fish place!) zin. Aside from that, for $35 bucks it was a great meal, wines and coffee came to $25 (but then, I knew I'd probably spend as much on wine as the meal, and was less than that here). I'll definitely go back but will be aware my meal will cost a pretty penny more than this." "Apparently they don't want to sell the idea of restaurant week because we were given normal menus and the event was not mentioned. I had to ask for the HRW menus. I can see why. The portions are huge - or, standard American big I guess, depending on your point of view. I had the lobster crab bisque, C. had the salad. The arugula/baby greens were fine, and it was enormous, easily split for two. A toasted piece of bread with cheese on the side was ok, but just like my toasted bread with the soup kind of...an after thought. The bisque was heavy on crab flavor, a little fishy, strong spices or roux taste, and thus overall heavy-handed - or maybe actually attempting to finish the portion was a mistake. C. had the organic roasted chicken, I had roasted salmon on roasted corn. The chicken was excellent, moist, flavorful, spiced. The salmon was underseasoned but prepared well. Again, large portions. Dessert - butterscotch flan with seasonal berries or a pie plate: two key lime pie squares, and two pecan pie squares. Key lime pie was lime-tart refreshing and the pecan pie was sweet chewy texture good. I'm not a fan of butterscotch so can't quite comment on the flan. Service was moderately attentive, a lot of large business tables competing for our attention. If you want the $35 to count, the Grove satisfies. I imagine if they do this a bit more they might scale back on the portions." "Had the HRW meal, with the recommended Cabernet Sauvignon. It was basically what you could get on a cruise ship, classic catering fare. Gazpacho was good start, crispy cucumber, just cooked shrimp, etc. Main dish was steak, and it was cooked only one way: dry! Sides of green beans and mashed potatoes were straight off the speed catering menu. Dessert was interesting, but it was basically cheesecake. Espresso was good. Service was basically unattentive, kept getting the, "Oh, you know what it is." introduction. Could see from others seated nearby that those not on the HRW menu were treated much much better (ex: they got water within 15 min!)" "it was pretty good, J. definitely ordered better things than i did. her appetizer, the fried ravioli was awesome and her veal was good and tiramisu was excellent. i had a couscous saffron soup was okay, but u could tell they watered it down. i had fettucine w/ wild boar ragu wasnt memorable and i had a puff pastry + honey dessert"
"my boyfriend ordered... Panadeddas di Cinghiale al Piccante (fried ravioli) for appetizer, Arrosto di Vitello ai Funghi (veal) for main course, and Tiramisu Cioccolato for dessert. My boyfriend said that of all the courses, the dessert stood out the most, which says a lot for him since he doesn't usually like tiramisu that much. The other two were good but nothing spectacular. He commented that the veal needed a little more of the sauce. I ordered the Misto Terra (sample of meats, cheeses, olives, and artichoke) for appetizer although I don't recall any artichoke being on the plate. I had the Ravioli al Granchio e Crema di Bottarga (ravioli with crab) for main course, and Seadas al Miele (puffed pastry with sweet cheese) for dessert. My main entree came with the bottarga cream sauce that was good, but I think the ravioli itself was slightly undercooked. I, too, found that the best part came last with the dessert. There was a scoop of I think vanilla bean icecream drizzled with caramel that tasted awesome with the puffed pastry, which had a good portion of honey (which I love!) on it. I also ordered a glass of white wine that I quite enjoyed-- I have on idea what it was (says "G Verminto" for $12.50 on the receipt) but it was the "better one" of the two available (I let the waiter pick). FYI-- the meal, wine, and bottle of distilled water came out to around $110 for the two of us. Gratuity was included at just under 17%. Overall, for the price that we paid, I'd say that it wasn't entirely worth it, except the dessert part. Then again, this was a special menu and I've never tried their normal menu items before!" the HRW list of restaurants and menus here. Thanks for capturing all the reviews that have been flying around on the Houston Chowhound Yahoo Group. Thank you so much for your reviews. I've used your insight to save time and money honing in on the best food in Houston. anonymous, don't forget to thank the houston chowhounds! and thanks for reading and leaving a comment. bloggers enjoy comments! I don't know if people know about this place, but I went to Polo's on Monday night for the first time and had a pretty good meal. The service was spotty for a slow Monday night, but the bread basket, basil butter, and pate were amazing. The tortilla soup was thick and flavorful, the baby lamb chops were thin but the sauce was good, the flounder was solid, the key lime pie was average and the cookie monster was a brownie with ice cream on top. The best item I tried was an amazing special, ravioli stuffed with lamb and mint. All the portions were enormous (most unfinished). The biggest downside to the restaurant was their penchant for calling too many menu items "famous," considering I'd never even heard of the restaurant until last week. @ rubiao - i've been to polo's before. it's owned by polo becerra of post oak grill. i'm not surprised you had a good meal there. the lunch i had there was fantastic but unimaginative and a little pricey. HRW is the perfect time to have an inexpensive meal there. thanks for the review. i will pass it along to the hounds.